Ukrainian President Petro Poroshenko has said legislative regulation of issues related to the status of the Ukrainian language as a state language is necessary. "We need a legislative settlement of issues related to the status of the Ukrainian language as a state language. 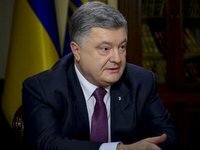 Moreover, we need an active position of the society aimed at expanding the scope of the functioning and application of the Ukrainian language, the implementation of all provisions of linguistic legislation without exception," Poroshenko said at the opening of the 25th Publishers Forum in Lviv on Wednesday. Poroshenko stressed that the Ukrainian language is one of the foundations of statehood. "We have an extremely important task - to ensure the development and functioning of the Ukrainian language as a state language in all spheres of public life and throughout Ukraine, strengthening the role of the Ukrainian language as a consolidating factor in Ukrainian society as a means of strengthening state unity," the president said.